When you’re in a hurry, but still want something fabulous for dessert, this is it! 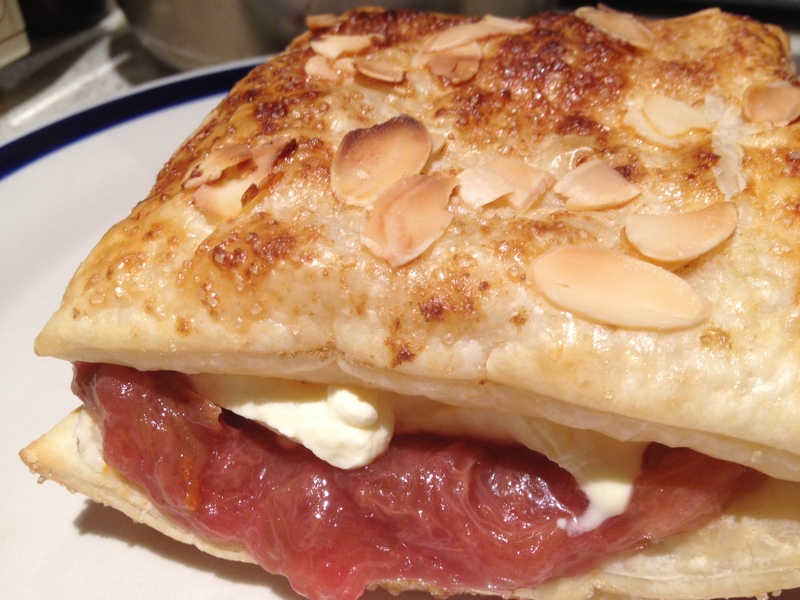 There is no particular skill required, and the beauty of this recipe is that you can use any seasonal stewed fruit if you can’t get rhubarb! Wash the rhubarb stalks well, and cut into inch long pieces. I used one large bunch, which had about 8 stems in it. Weigh the raw rhubarb, and then measure twenty percent of the total weight of the rhubarb as raw (demerara) sugar. Then chop two pink lady apples (or any other apple of your choice) into smallish pieces, leaving the skin on but removing the core. 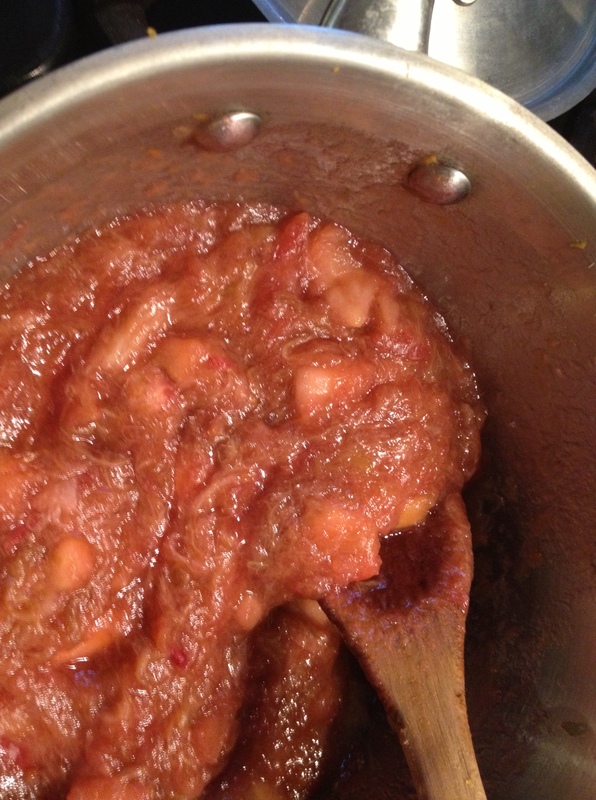 Throw the sugar, rhubarb and apple into a pot. Add a squeeze of lemon juice. The rhubarb will break down and release its own liquid so no other fluid is required. Cover your pot and place over a low heat. Stir occasionally so it doesn’t stick. 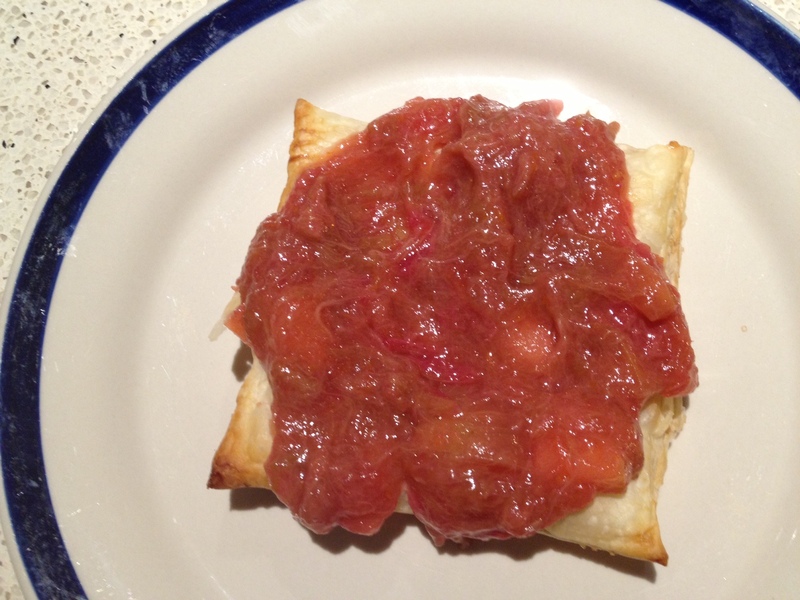 It will take about ten to fifteen minutes to cook, and the rhubarb and apple will be soft and delicious. Set aside. You can serve this warm or cool – whatever is your preference. Beat 300ml cream (or a cup – don’t get too fussy about quantities here), a dash of vanilla and a spoonful of sugar to taste (you don’t want it too sweet) until it forms soft peaks. 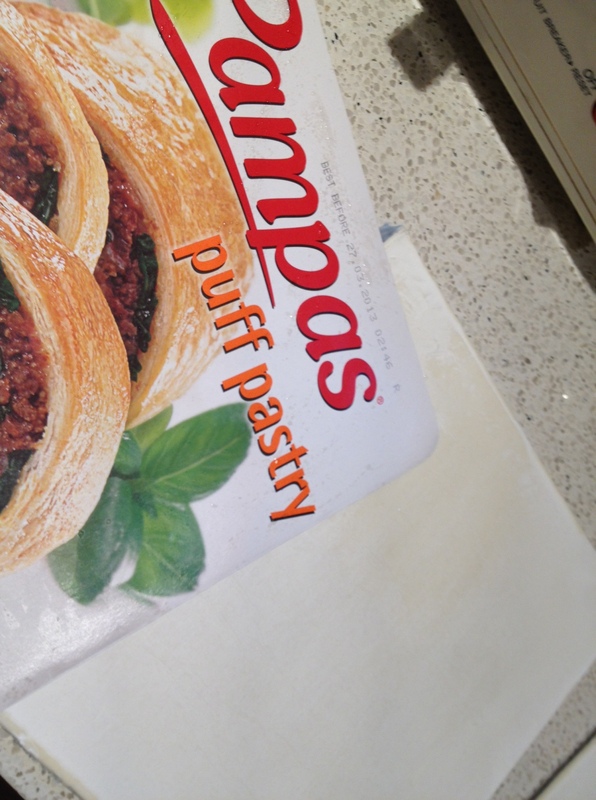 Preheat your oven to the temperature recommended by the pastry manufacturer. 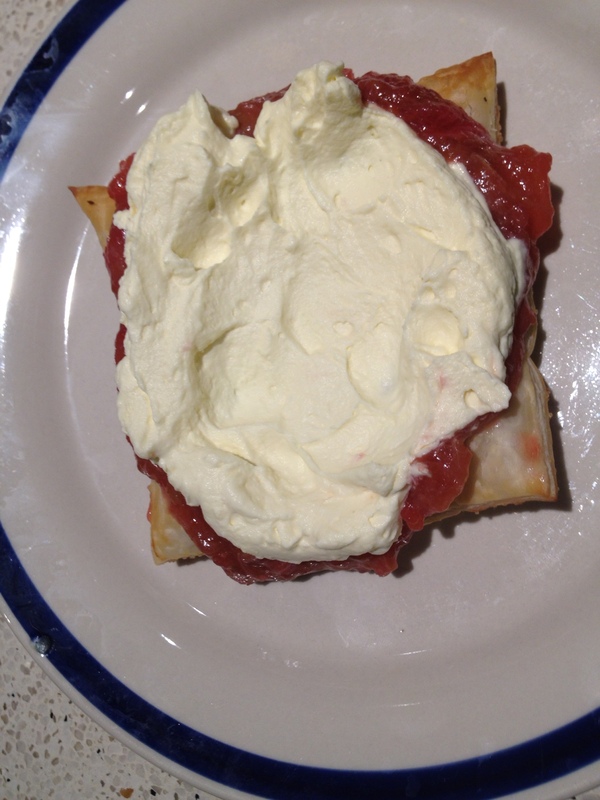 Use two sheets of a commercial puff pastry. Cut each sheet into four. Lay the sheets on some baking paper on a metal tray. Beat the egg with a dash of water, and brush over the pastry. 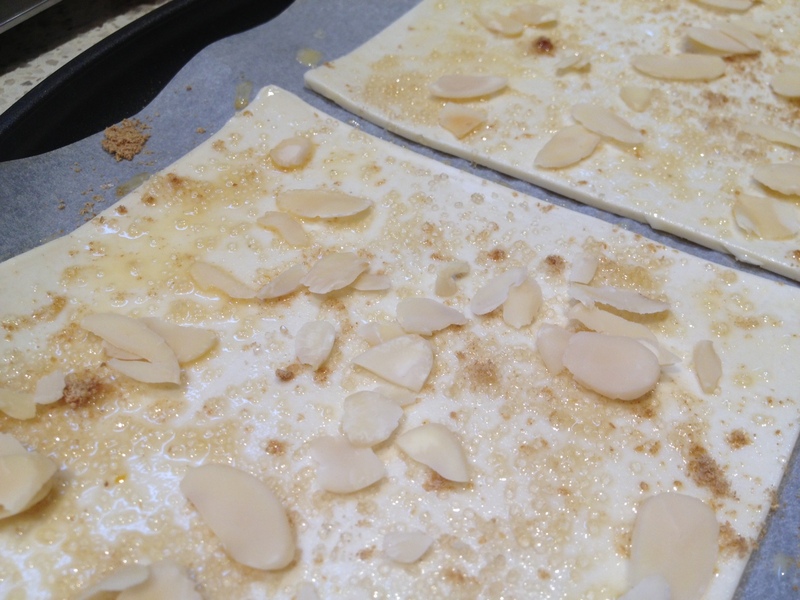 Then sprinkle four with a little raw (demerara) sugar, and the other four with some sugar, a dusting of ground coriander seed and the flaked almonds. Put into the oven until puffed and golden (about ten minutes). 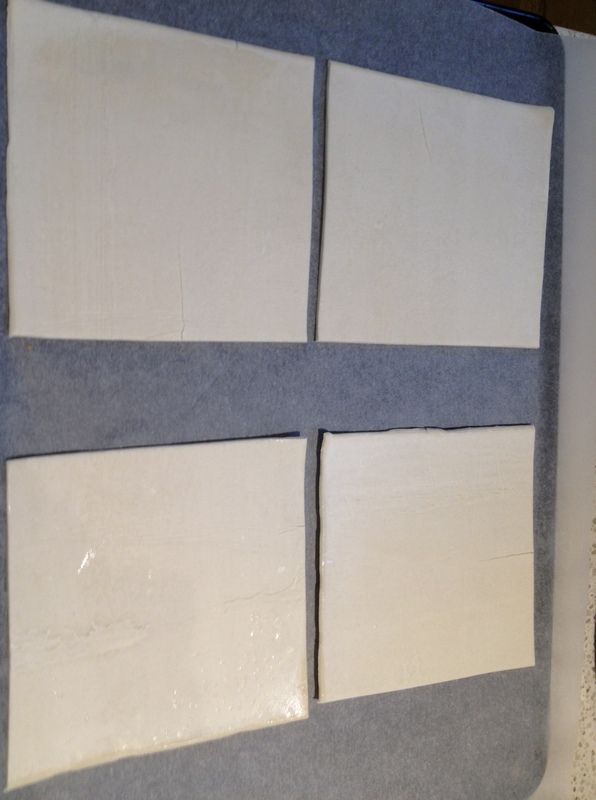 To assemble, flip the four squares that have no almonds upside down onto a serving plate. Add a layer of rhubarb, pushing roughly to the edges. 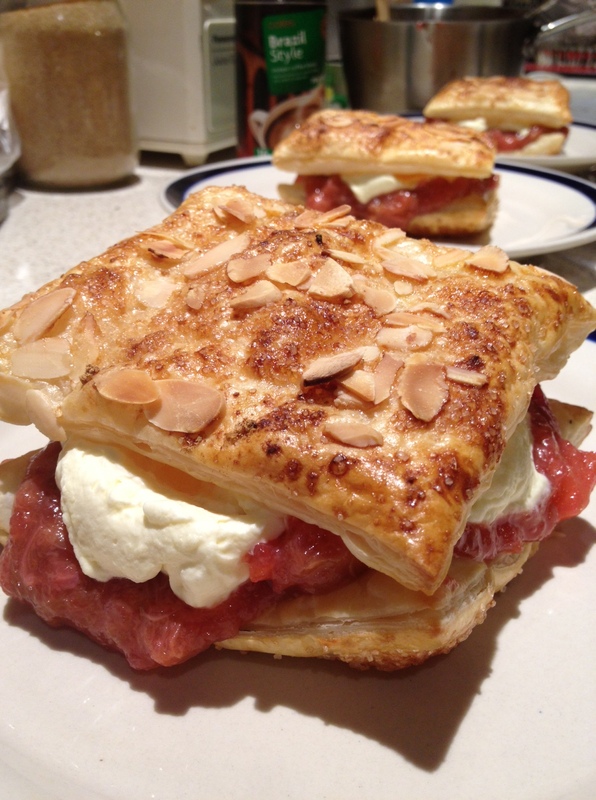 Spread a splodge of cream on top of the rhubarb. Top with the other pastry lid, and you’re done. These are best made close to serving time so that they don’t go soggy. Pastry lids can be made in advance and stored in an airtight container. Recipe can easily be increased for a crowd. For an afternoon tea or something slightly daintier, you could also cut your raw pastry squares in half again, which will end up making eight long fingers instead of the four larger puffs. If you have any compote left over, it goes very well with scones (biscuits), or as a sponge filling. It’s also a perfect match with a good vanilla ice-cream. Enjoy! This entry was posted in Cakes and desserts, Fast and Fabulous! and tagged baking, comfort food, cream puff recipe, easy dessert recipe, farmhouse baking, food, rhubarb and apple, rhubarb and apple compote, rhubarb compote, rhubarb recipe by Cauldrons and Cupcakes. Bookmark the permalink. How delicious, I like the idea of making little bite size ones of these, they could be temptingly moreish. Looks wonderful! 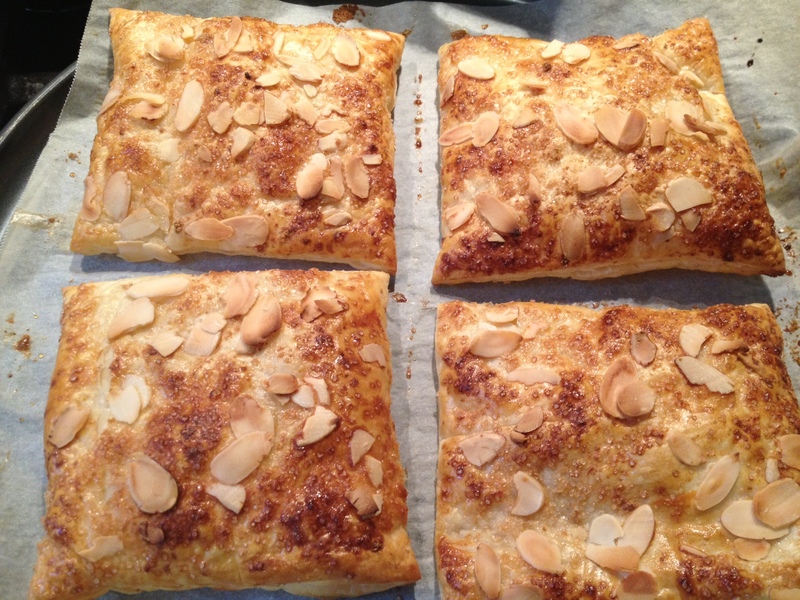 I always forget about puff pastry sheets, but they are so useful!